Could this be the ultimate Digital Music player? This device includes solid state storage for secure storage of your music files. It has WiFi and wired network interfaces, allowing external access to your music, and to store downloaded music. It features a network music player with battery power supply for the ultimate in noise-free playback, and up-converts PCM audio streams to DSD64 for better noise performance. you can drive it from an App, or via the device controls and screen for local playback, and use it as the network source for your music in other rooms. For more details than you can poke a stick at see the Astell & Kern website. 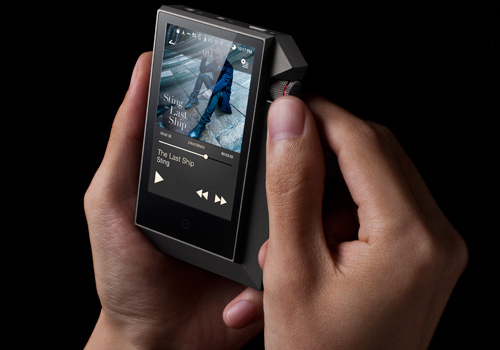 Astell & Kern have become synonymous with super high quality portable music sources. This is the answer to those who are looking for something better than the usual fruity portable music players (if you know who I mean!). It used to be that you’d have one product for the home HiFi, and another for portable use. This meant two versions of your music: an uncompressed version for the home, and a compressed version to fit onto your portable music player. Not any more! The Astell & Kern AK-Jr at £399.00 is the entry point to portable, super-high-fidelity audio systems capable of Studio Master Quality sound. Studio Master Quality audio refers to lossless & high-resolution audio source formats, typically 24-bit and up to 192kHz sampling rates used in studios as a master recording. Because Studio Master Quality audio delivers about 6.5 times more detail than a conventional CD format (16bit/44.1kHz), listeners are able to enjoy a better and more realistic sound quality. When a CD is produced, the studio master files have to be compressed down to 16bit/44.1kHz so they can be stored in CD format. When ripped or converted to MP3 format, the audio is compressed even further to reduce the file size to fit onto a portable device. This compression removes enormous amounts of detail from the original recording, which is impossible to recover. It is far better therefore to keep the audio in the highest resolution format possible for the best replay quality. Studio Master quality recordings are rapidly becoming more available as downloads as the number of high resolution playback devices increases, and memory storage is becoming lower in price, so there’s little point in compressing audio files. Large storage capacity ( maximum of 320Gb total) for all of your music whether in high or standard resolution. Can act as a USB DAC when connected to a PC to improve the sound quality available form your computer. Impressive duration of up to 14 hours of continuous playback on battery – The battery is the ultimate in noise-free power supplies for the highest quality of music playback. Come and visit our showroom where you can experience digital music at it’s best quality in a portable format. The Astell & Kern AK380 is the flagship model from Astell and Kern, with 256Gb internal storage, expandable with a further 256Gb Micro SD card slot, higher quality headphone / output amplifier and machined in aircraft grade solid aluminium. Priced at £2,999 this is not cheap, however, this is probably one of the best sounding portable players we’ve ever heard – correction make that one of the best sounding digital music players of any sort that we’ve ever heard. Use it on your main HiFi as well as on Holiday. The siren series In-ear monitors are named after famous rock songs about women. Jerry Harvey Audio produced a special version of the Roxanne tuned for the Astell&Kern in 2014. The collaboration was so successful that the two companies will now release two more models. The first new model is the Layla. This all new flagship model is nothing short of stunning visually as well as sonically. The second in the “Sirens Series” line, it is worthy of being named after possibly the most famous love song in Rock history. Recorded By Eric Clapton, with his band Derek and the Dominos and released in 1970 on Layla and other Love songs. Layla was inspired by Clapton’s unrequited love for Pattie Boyd, the wife of his friend George Harrison. Full carbon Fiber Body with “Burnt” titanium Bezel and Carbon Fiber logo Insert.